When the evenings get darker, so do the beers. And this is one of the darkest there is. Inky black, strong and indulgent. 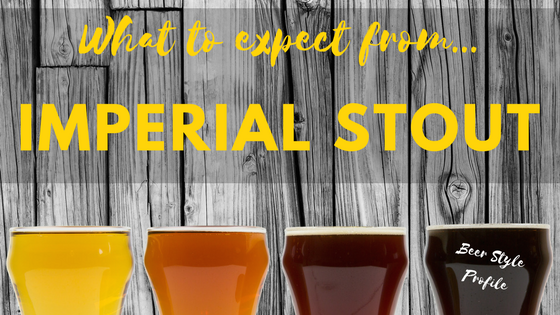 There’s plenty about an imperial stout to keep you warm on a winter’s night. Historically these beers were brewed strong for export to the Baltic States and Russia, where they were said to be popular with the Russian Imperial Court. In the glass expect a jet black, opaque beer with a good head of foam. This is usually creamy tan to dark brown. The retention may be fairly low in some examples. If you swirl these beers you can expect to see them ‘stain’ the side of the glass – the high alcohol leads to a high viscosity. The aroma should be rich and complex. Expect roasted notes, malty sweetness, fruity esters, boozy alcohol notes, but not usually much hops. The roasted malts can express notes of coffee, dark chocolate, or sometimes charred or burnt tones. The fruity esters will tend towards dark fruits: plums, berries, raisins and currants, plums, prunes. There can be vinous elements to the aroma. You will quite often see barrel aged versions which will reflect the wood of the barrels and the characteristics of the spirits they once held. As with the aroma, so with the flavour; again expect a rich and complex taste, that is often quite intense. The same characteristics should appear: esters recalling dark fruits, malt sweetness with varying degrees of roasted notes, giving bittersweet or unsweetened chocolate, cocoa, and/or strong coffee. A slightly burnt grain, burnt currant or tarry character may be evident. There should be no sour notes, no diacetyl. The hop bitterness should be present just enough to provide balance. The palate and finish can vary from relatively dry to moderately sweet, usually with some lingering roastiness, hop bitterness and warming character. These are big beers with big ABVs to match, ranging from 8% to 12% and sometimes even higher. Look for a full body with a velvety mouthfeel – but nothing cloying or syrupy. A gentle smooth alcohol warmth should be present and noticeable. Carbonation may be low to moderate, depending on age and conditioning.